So a woman in her 40’s was discovered unresponsive at home and emergently brought to hospital. She was known for severe rheumatoid arthritis and had had two CVAs in the past. She had unfortunately suffered from distrust and noncompliance. 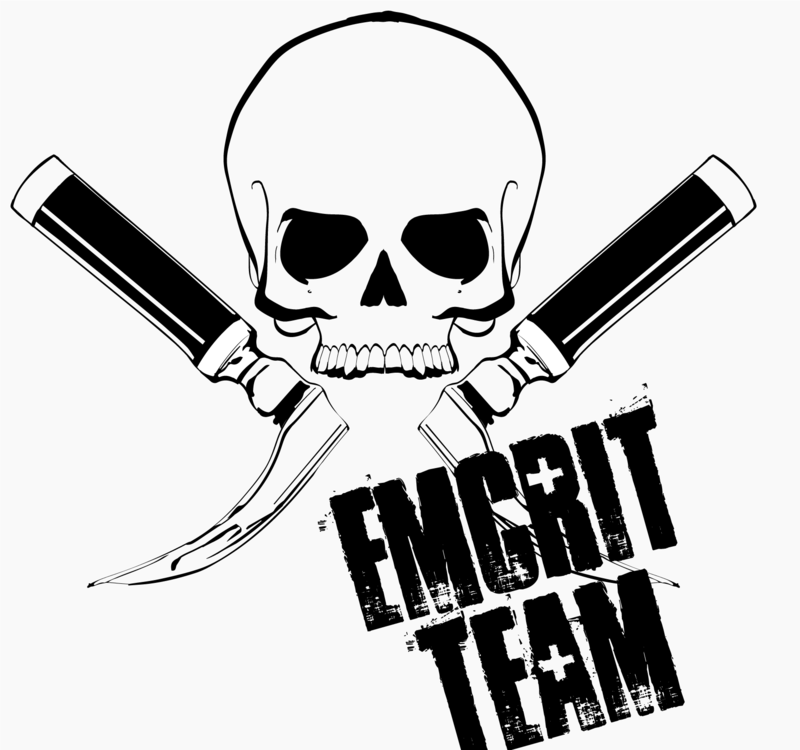 An emergency cricothryrotomy was done for a difficult airway which, due to difficulty ventilating (no cuff in our cric kit) was exchanged to a 6.0 ETT over a tube exchanger. Unfortunately our CT scan was up for maintenance, so the CT head was delayed. Our working diagnosis was another CVA with an aspiration pneumonia. So the optic nerves are dilated significantly (bilaterally), suggesting an ICP over 20 mmhm at the very least. It was fairly difficult to find a good vessel, and likely at a bifurcation hence a narrow and bidirectional spike on doppler. The signal noise made it difficult to look clearly at diastolic flow and make a definitive call of circulatory arrest. After family discussion, we withdrew therapy. So one of the questions a colleague asked is whether I would have been comfortable making the call of an acute and severe process at the bedside and deciding to withdraw therapy, and at this point, I would have said no, in this particular case where the TCD signal wasn’t quite clean enough, and in a center with CT scan availability. I could, however, see a clinical scenario where, with a better TCD signal, I might do so, especially if I were in a remote area. 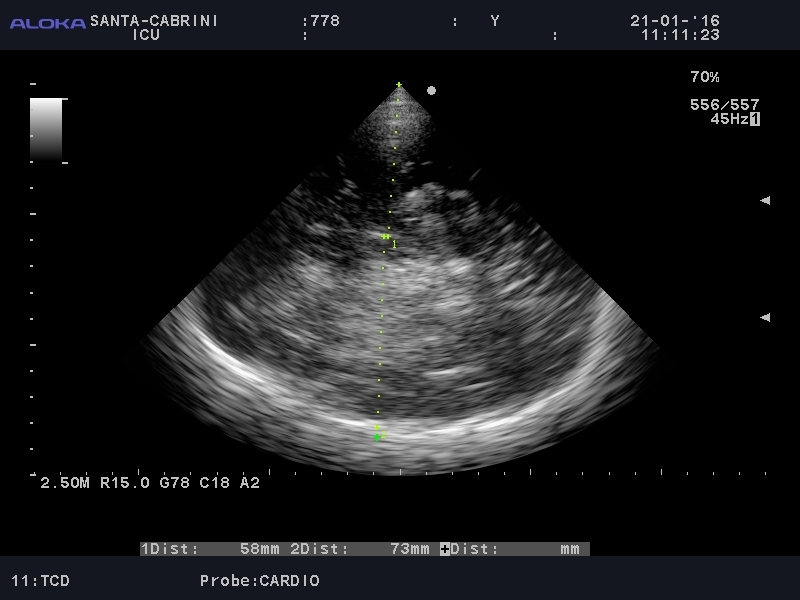 ​Can you “call it” with CNS POCUS? A dear friend and colleague wrestled with a difficult situation. A patient, who despite chronic diseases had distanced themselves from the medical system. Found collapsed, a long and hard fought resuscitation ensued. Airway challenges, ventilation and oxygenation challenges had to be overcome as part of a prolonged code. After Return of Spontaneous Circulation (ROSC), attention turned to the neurologic exam. Beyond the clinical history of prolonged cardiac arrest with the complicating hypoxaemia, the clinical exam was non-reassuring. Technical factors delayed access to CT scanning of the brain. 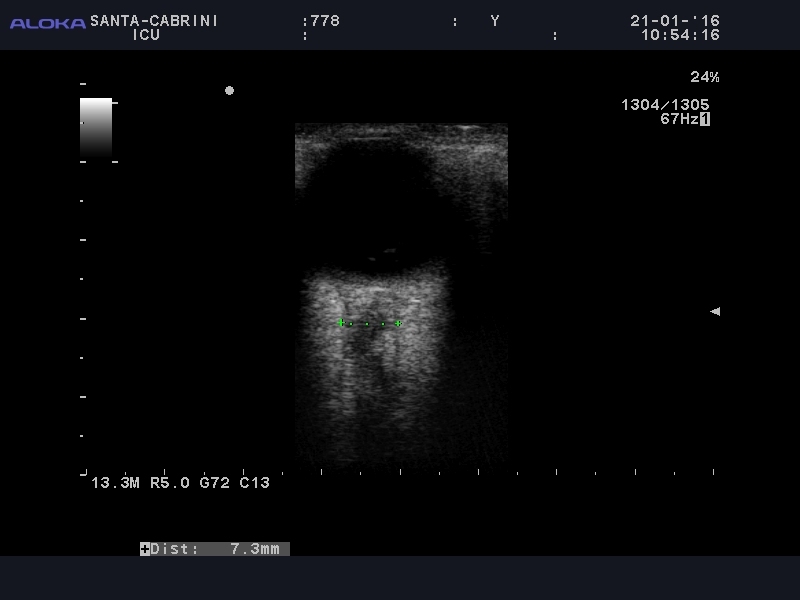 Optic nerve sheath ultrasound (an anatomic assessment) suggested raised ICP. Transcranial Doppler suggested the physiology of raised ICP. 2D grey scale ultrasound imaging of brain demonstrated asymmetry (yes, the team was THAT good). 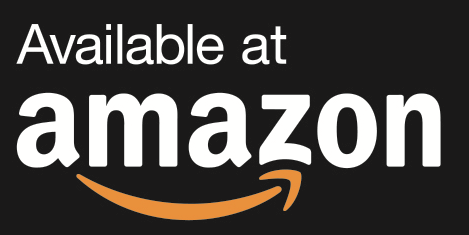 The question: should one stop resuscitation based on CNS POCUS alone?. “Calling it” in resuscitation has a long history of being based on the clinical history and clinical examination alone. Think of the many “code blues” that you have attended. Many efforts have terminated with the team having decided that the patient could not be resuscitated without any imaging modalities employed, point of care (POC) or other. “Calling it” with POC ultrasound (POCUS) starts its history in the emergency department which eventually became the American College of Surgery’s Committee on Trauma (ACS COT) codified Focused Abdominal Sonography in Trauma (FAST). 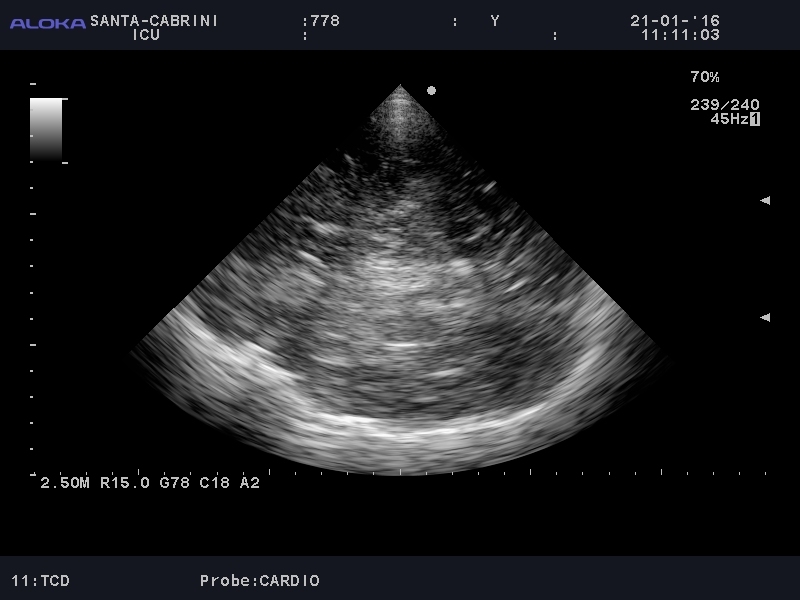 Patients were sent for laparotomy or subxipoid pericardial window based on POCUS alone. POCUS, in great urgency offered the clinician improved access to diagnosis and thus improved access to resuscitation direction for the patient. What about “Calling it” for brain injury? Does the faster access to resuscitation mean something in this situation? CT scans of the brain are the standard of care in this situation. POCUS has never meant to replace standard imaging modalities (echocardiography by cardiology, abdominal imaging by radiology, vascular Doppler, etc.) but rather to augment the physical examination, screen for time critical injuries and offer easy repeatability particularly in time sensitive situations. 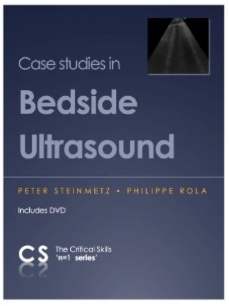 Which POCUS element is important in this case? None and all. Would one stop CNS resuscitation without knowing the mechanism or resuscitatability of the CNS injury without a CT scan? Even in the hands of a vascular Doppler lab, transcranial Dopplers are supportive tests at best for neurologic determination of death (as opposed to ancilliary tests: 4 vessel angio, CT angio or scintigraphy). Stopping resuscitation at this phase (ROSC) based on POCUS would put the patient into a palliative mode as opposed to stopping a code wherein the previous diagnosis of death and non-resuscitatability is acknowledged. Still, should they have “called it”? POCUS does another wonderful thing. It asks the clinician to touch their patient. 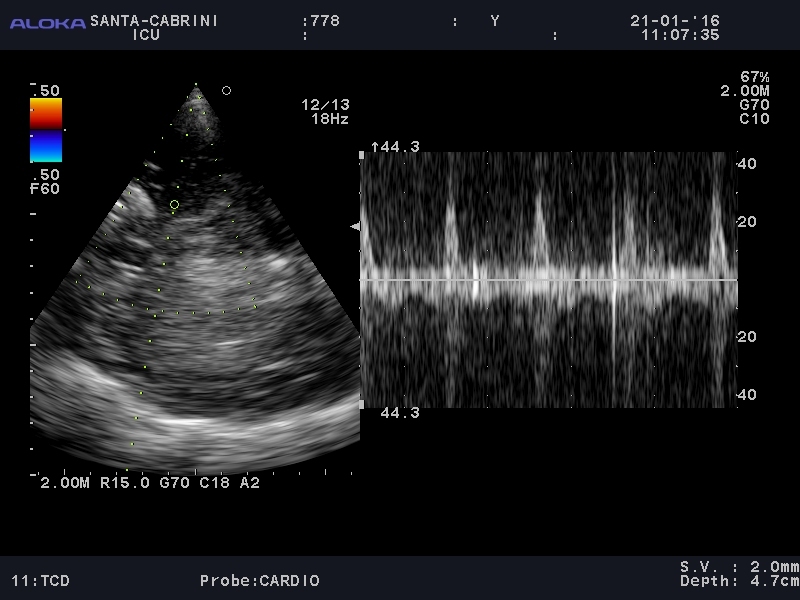 Rather than being the acute care quarterback (often recording the nurses vital signs rather than performing their own) who orders “STAT ECG, CKs, troponins, and get cardiology here to do an echo” the POCUS able clinician spends a few more seconds examining and speaking to the patient, often offering the patient more clinical information quickly. POCUS brings us closer to out patients. We examine them for longer. 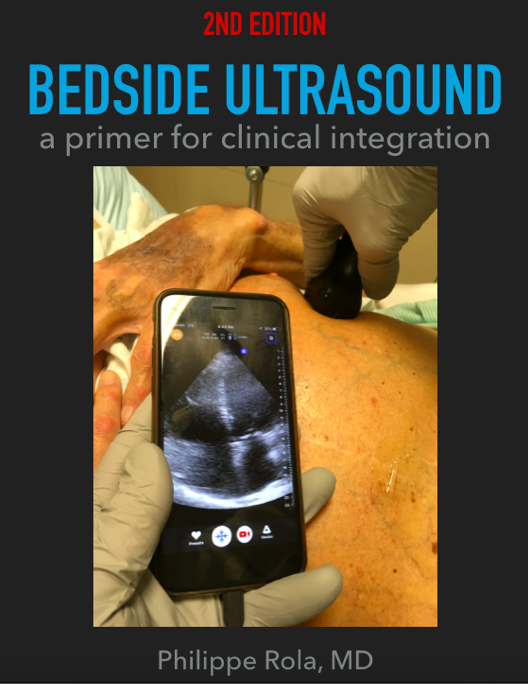 Describing POCUS results and their significance in a contemporary fashion to the patient and/or their loved ones forces us to communicate more. Stop CNS resuscitation without tomographic imaging in Canada? No. Understand CNS anatomy and physiology better through POCUS? Sure. Become a better CNS resuscitator as a result? Probably. Communicate better to patients and families at the end of life through POCUS? A strong possibility. ← Resuscitation Leadership Academy: Check it out! Great case, thanks very much. I’m curious – do you use pulsatility index on TCD or just flow patterns such as bidirectional flow?